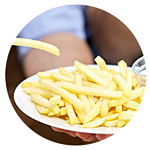 French Fries have never been more popular across the world, with geographical expansion in French Fry production and potato processing in general reaching extraordinary new levels. With this expansion has arisen a host of new industrial needs and challenges. Some businesses need to process a wide range of potato sizes and sweet potatoes for example, while some need to be sure that many different varieties can be peeled efficiently. When you add seasonal anomalies, fluctuating trade tariffs and unpredictable weather patterns across the globe; you see that production line management, efficiency and waste reduction have never been more important. 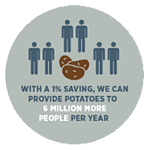 So what can potato processing businesses do today to improve their productivity? Let’s start with the weather. September is traditionally one of the most informative months for the potato processing industry. Fresh potatoes enter the processing facilities directly from the fields as opposed to the cold store, giving business managers a good sense of the challenges they may face over the next nine months. This year has been quite unusual for many European growers. They have had to endure extremes in weather conditions. In the early spring there was the exceptionally high snow fall in some regions and then in summer the same regions experienced drought conditions. Hot, cold or wet spring conditions can create a delay to planting. Growers are acutely aware of the effects that a late frost or a late cold snap can have on potatoes in the ground and therefore they tend to wait until the correct time to plant their crop. Delayed planting of potatoes means that the potatoes may not receive sufficient water and could be damaged by drought conditions. This risk is forcing growers to invest in irrigation systems to protect the crop and to protect against future issues; investment that has to be recouped further down the line if the crop is to produce a profit. If growers get planting timing wrong or are unable to correctly control soil irrigation, the quality of their crop will be sub-par, further impacting its profitability. Because of the highly unusual weather patterns in 2018, we are already seeing potential issues, with first reports from potato growers and processors indicating a reduction in both average potato size and quality. The latest news is that potato prices are going up. A combination of industry expansion and reduction in crop yield are the cause of this. We estimate that expansion in the French Fry industry between 2018-2019 will result in an additional demand in the region of 5 million metric tonnes of potatoes per year. When you combine this with expansion in other areas of the potato processing industry you get a sense of the size of the growth. During the 2017-2018 season the potato prices averaged €100/mton, in western europe. Today we see prices in the region of €250/mton. In the middle east or Asia we see higher potato prices. The pressure this places on operating costs is more significant than before. Yields and steam peeling performance become so important and if you haven’t the correct solution in place there is a significant probability of loss of competitiveness. Read why Kaida decided to invest in TOMRA's French fry sorting and peeling solutions, and obtained a high efficiency and low peeling loss. Global politics may also have an impact on the future of potato production. Intensified competition between USA and China has resulted in a significant number of trade tariffs being imposed. Although to date US French Fries which are exported to China have been spared from tariffs, we have seen a reduction in the volume of China imports of Frozen French fries from USA. China has been steadily increasing production capacity of French fries and have been growing imports from European countries and parts of Asia. It is not clear how this shift will impact that USA potato processing industry, but one thing is for sure, we can expect change. When you add these issues and begin to analyse what can be done to protect against climate, pricing and geopolitical challenges that effect the potato industry, there is only one solution: increase operating efficiency. This is mainly achieved by increasing yields and reducing waste. The peeling process is an obvious place to look because it is such a central part of production and an area that can, if mismanaged, lead to excessive waste. Steam peeling is by far the most popular process today for clear reasons: it minimises waste, provides a healthy return on investment and leads to savings across many downstream processing steps. Reduce loss at the peeling stage requires a reduction in peeling time and the removal of aggressive post peel brushing. Many processors are looking for a solution that is reliable and flexible enough to cope with many different types of potato and is adaptable in case of potential quality issues resulting from unusual weather patterns. There are a very wide range of potato varieties (more than 4000 in Peru alone) and it is our objective to be able to peel every variety, bringing a vast increase in choice to any potato processing business. Our peeling demonstration lab in Ireland is being used every week to test potato varieties and other root vegetables at a range of steam pressures to find the correct set-up and solution for each business we work with. 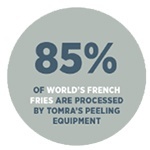 The TOMRA Eco Peeler, for instance, is now installed at the majority of high volume French Fry processing facilities. This is because that it is proven to reduce peel times versus the other solutions in the industry. When you consider the rapid steam supply arrangement and rapid steam exhaust you save time and waste. On a 50/mton per hour line this could be a 1% saving or €0.5m. 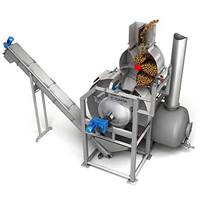 Using a TOMRA 5A sorter with a peel control module and a repeel solution is the most efficient way to manage quality after the steam peeler. This solution automatically sends potatoes with minor surface defects and remaining peel to the repeel solution, to clean up these potatoes. Contact us today to discuss your specific needs or arrange a demo.